Still waiting for their first opportunity to prove their worth on the battlefield, the events of April 26, 1862, yielded temporary satisfaction to the men of the Lancaster County Regiment. 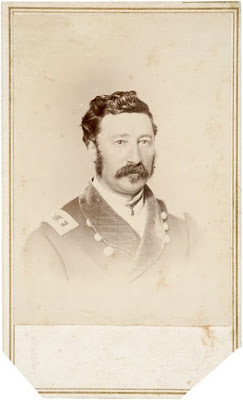 On that day, the events of which 79th Pennsylvania soldier-correspondent Corp. Elias H. Witmer recorded in a flowery letter, the regiment marched to restore the Stars and Stripes to the top of the courthouse in Columbia, Tennessee. Their brigade commander, Gen. James S. Negley, addressed the assembly and reached out to any civilians wishing to live under the old flag and Constitution. He concluded by pointing at the American flag and remarked that "cotton was only king when it floated in that banner." In his letter, Witmer continues to explore his thoughts on slavery for readers in Lancaster. Adopting the mantle of a mudsill (see this post for explanation), he hints that the idea of emancipation is growing on him: "I am free to confess that my opinion of the South and her 'idol pets' has not changed so much that I would turn rebel to the government if the funeral knell of slavery would be sounded over every foot of slave territory in the world." Finally, the regiment received a flag from General Negley, apparently the second received from him. After the flag flap of November 1861, it seems that the regiment was content with a generic United States flag rather than the beautiful battle flags most other Pennsylvania units carried.